Ann Askey, OH adviser at Brunel University, and the charity BackCare, discussed the findings of an evidence-based research study on the effectiveness of an OH intervention on low back pain. 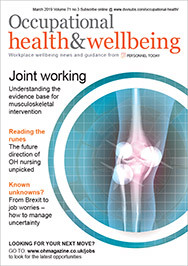 The research was devised to discover whether beliefs and behaviour regarding low back pain management can be influenced positively at the recruitment stage to help reduce sickness absence rates due to low back pain. The study group was made up of 197 new frontline recruits within the London Ambulance Service, who were divided among four ambulance training centres – two of which were used as the control population and the other two as the intervention population. During induction training, the intervention groups completed pre-test questionnaires, which included psychosocial questions and the ‘back beliefs’ questionnaire. They were shown the video, Get Back Active, and given a copy of the Stationery Office guide, The Back Book. Although the control group completed the same pre- and post-test questionnaires, they had no other input. Follow-up tests were completed on both groups six months later. Results showed that the intervention group were less likely to report spells of low back pain or to blame work for any pain experienced. Interestingly, the control groups were even more negative about their low back pain on the second testing. According to Askey, the research proved that the inclusion of a dedicated programme on low back pain management, including information from the video and book, encourages positive back pain beliefs among new recruits.